•Find the parson’s nose of your chicken (it’s at the rear end and resembles something of a triangular tail no larger than the joint of your thumb) and cut it off – it will make your stock bitter if not discarded. •Rub the chicken all over with the salt, then place it in a large saucepan and cover it with cold water until fully submerged. Finely slice the ginger and add three-quarters of it to the saucepan along with the stock cube. •Using the flat side of a knife or cleaver, smash the garlic and peel away the skin. Set aside with the remaining ginger. Mix the sesame oil and light soy sauce together in a small bowl. • Cover the saucepan with a lid and bring to the boil. Once the water starts to boil, reduce the heat and leave to simmer, covered, for 20 minutes. Remove the saucepan from the heat and leave the chicken to sit in the covered pot for a further 40 minutes. • Carefully remove the chicken from the pan, reserving the cooking liquid, and submerge it in a separate pot of cold water for 2 minutes. Drain and then baste it in the sesame and soy mix. Set aside to rest for 20 minutes. • Meanwhile, wash the rice, then place in a pan with the remaining ginger, the garlic clove and 320ml of the chicken poaching liquid. Mix together well, then cover with a lid and bring to the boil on a high heat. Once boiling, lower the heat to a simmer and cook for 10 minutes, then turn the heat off and leave to steam with the lid on for a further 15 minutes. • While the rice is steaming, make the ginger oil. Add the finely chopped ginger, spring onions and salt to a small serving bowl and mix together. Heat the oil in a small frying pan until smoking-hot, then pour over the ginger and spring onion to sizzle. Mix together well. 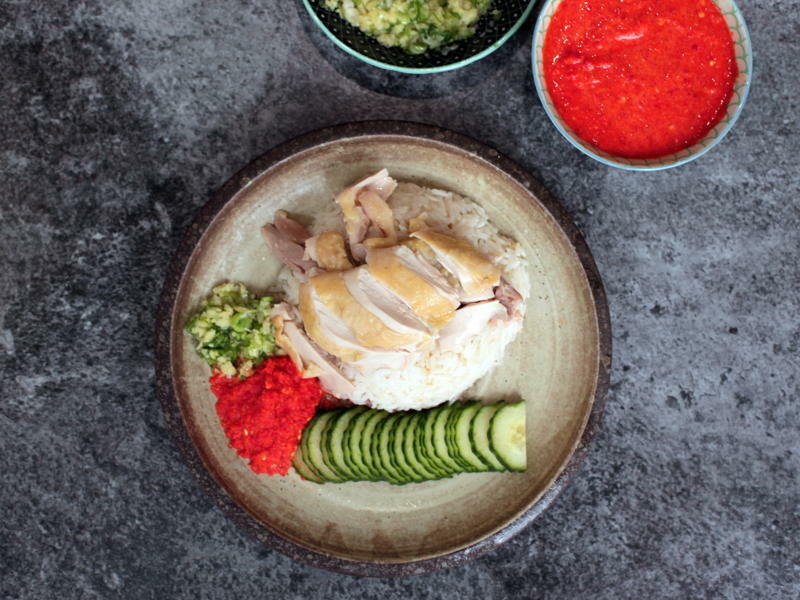 • Carve the chicken and arrange on a large serving platter with the ginger oil and chicken rice. Accompany with slices of skinless cucumber and chilli sauce, if desired. TIP: To check that the chicken is thoroughly cooked after sitting in the hot water for 40 minutes, poke a small, sharp paring knife through the thickest part of the thigh and press into the skin a little. If the juices run clear and no blood is present, the chicken is ready to eat. -Roughly chop the ginger, garlic and chillies and place in a food processor. -Put all the hot liquid ingredients in a small saucepan and bring to the boil. Once the sugar has melted, switch the hob off and pour the hot liquid into a food processor. Pulse until a paste-like consistency has formed.